The People’s Liberation Army officially took ownership of the first Russian-made S-400 regiment last week. The Chinese People’s Liberation Army (PLA) officially took ownership of the first regimental set of Russian-made S-400 Triumf advanced interceptor-based air defense systems (NATO reporting name: SA-21 Growler) last week, according to Russian media reports. 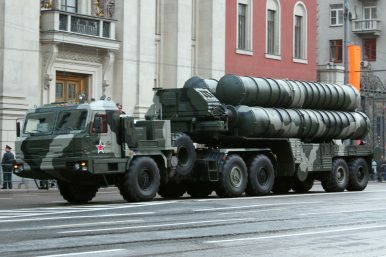 “Last week, an acceptance certificate was signed for the first batch of S-400 systems that was delivered from Russia by sea in May 2018. The systems passed over to China’s ownership once the documents was signed,” a Russian source is quoted by TASS news agency as saying earlier this week. The first two Russian cargo ships carrying the bulk of the S-400 equipment, including launchers and mobile radar systems, arrived in China in April. The last delivery reportedly took place in early May. Russian personnel has been handing over the equipment to the Chinese military over the past months, a process which apparently has now been completed. A road-mobile S-400 battery can deploy within five to ten minutes and engage up to 36 targets simultaneously. It is not known what missiles China has ordered from Russia. According to some reports, the first regimental unit delivered to China will be armed with the 48N6E2, next to other missiles, whereas the second regiment might receive the 40N6E, the export variant of the 40N6. The 40N6 is the S-400’s most advanced missile interceptor and is expected to be inducted into service with the Russian military this month or next. The Russian military accepted into service its first S-400 regiment of the year earlier this week, bringing the total number of deployed S-400 regiments in the Russian military to 24, according to a Diplomat estimate. By 2020, this number is expected to grow to 28 regimens or 56 battalions.